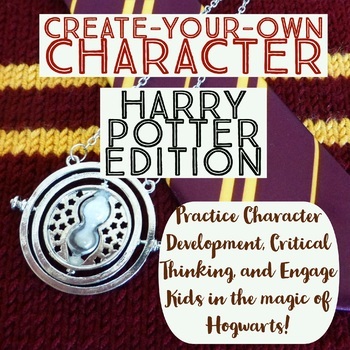 Harry Potter Character Creation - Help Students Picture Themselves at Hogwarts! Are you reading Harry Potter or looking for a high-interest anticipation guide between books? Take a look at this character creation kit! This two-page, one-day assignment is the perfect activity to engage students in the magic of Hogwarts. Give this engaging activity a try in your next whole-group or small-group reading, Book Club, or literacy circle! *Note: This assignment was originally designed as an early assignment for Harry Potter and the Goblet of Fire. All questions but one are generic, and the last can be easily changed to match the book you're reading!